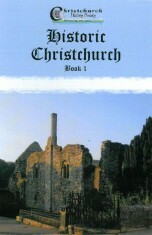 The story of aviation at Christchurch is told in this book, the first of two in a series. the Supermarine Spitfire, the Bucker incident and the fatal crashes at Foxwood Avenue. 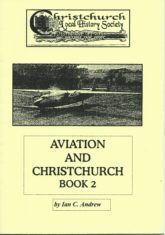 The story of aviation at Christchurch continues in this book, the second of two in a series. of the M2 Submarine off Portland Bill. (1919 – 1997) an enthusiastic local photographer who had a strong interest in local history. 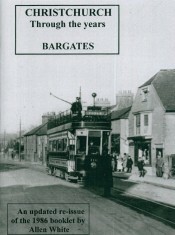 This book covers the Bargates and Fairmile area of Christchurch and includes both photographs and text. In this book John Peatey recounts the events of the afternoon of 12th January 1952 which sent tremors of alarm throughout the Air Ministry top brass. The prototype Vickers Valiant Bomber, on a test flight from Hurn Airport came to earth and disintegrated. The scattered burning wreckage centred in Harrow Wood on the outskirts of Bransgore. (1919 – 1997) an enthusiastic local photographer who had a strong interest in local history. 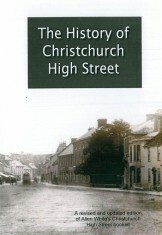 This book covers the Bridge Street and Purewell area of Christchurch and includes both photographs and text. 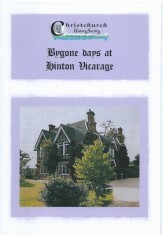 This book is a brief account of life at Hinton Vicarage at the beginning of the twentieth century. It describes the history of the village cricket team, shares incidents of village life and gives details of rare plants that were in the Vicarage Garden. RHS Hatton was born in the Vicarage in 1909 and remained there until his father died in 1932. This best-selling book tells the story of a lost industry that used women and pauper children in Hampshire and Dorset making a tiny watch and clock component at the risk of their eyesight. 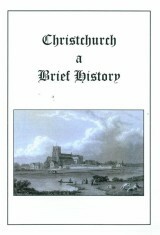 This book gives a brief history of Christchurch which originated on the low ridge at the confluence of the river Avon and the river Stour at the landward end of Christchurch Harbour. 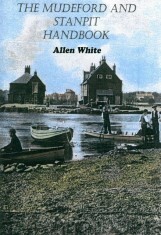 The book reviews the town’s history and growth through from Mesolithic to Modern times. This book reviews the land adjacent to Mudeford Lane, known as “Burry’s Field”, used in the early 1920’s for horse racing, before becoming the venue in June 1926 for Surrey Flying Service’s ‘five shilling’ flights. 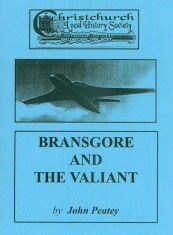 Shortly afterwards “The Hampshire Flying Club” at Hamble began using it regularly at weekends for trips to Bournemouth. A selection of early prints and maps dating from before photography was invented. 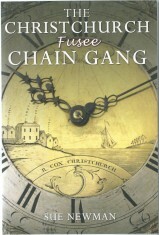 The story of the people of Christchurch who made fusee chains – who they were, what they did and how they lived from 1700 to 1900. A study of poverty and survival and bygone trades, with major discoveries about the watch industry as carried on in the town. 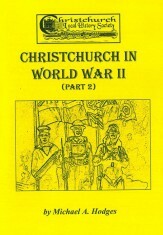 The story of Christchurch in the Second World War is told by Michael Hodges in two parts. 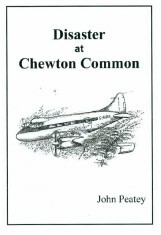 In this book John Peatey investigates the crash of a De Havilland Dove airliner. It came to earth in tragic circumstances at Chewton Common on 13th March 1947. The book describes the events leading up to the crash, together with an eyewitness account, photographs and a detailed post mortem of this local disaster. A must for those interested in local aviation. Highcliffe in 1914 was a small village, but like the rest of the country, it was affected by the carnage of the First World War. In excess of 200 men from the village went to war, and nearly 40 did not return. 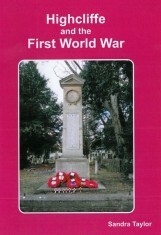 Their names are on the Highcliffe War memorial, but who were they and where did they fight? Take a glimpse into the forgotten past. 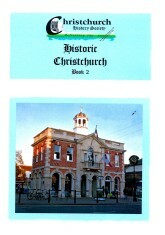 The first book in a series that is a compilation of historic articles written by Members of the Christchurch History Society, originally published in the Society’s quarterly Journal. 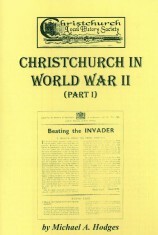 The second book in a series that is a compilation of historic articles written by Members of the Christchurch History Society, originally published in the Society’s quarterly Journal. (1919 – 1997) an enthusiastic local photographer who had a strong interest in local history. to the 1843 Tithe Map. 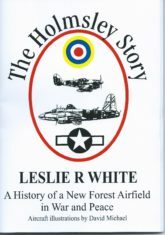 To re-create today the atmosphere of the Second World War is impossible but local historian Les White has drawn on many sources previously untapped to explain why and how the RAF Air Station at Holmsley South in the New Forest fitted into the jigsaw of the war and its aftermath. This should enable the reader to appreciate something of what took place all those many years ago. 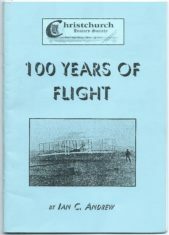 This book was published by the Christchurch History Society to mark one hundred years of powered flight on 17th December 2003. 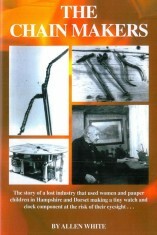 The book records some of the pioneers and aircraft companies who made the continuous development possible. The important dates have been portrayed in chronological order to show how quickly progress has been made from a few seconds to hours of flight being achieved, and progress from solo flight to hundreds of passengers being carried. On 17th December 1903, the Wright brothers made four powered flights of ninety-seven seconds in total in a biplane powered by a 12hp engine which they had designed and built themselves. This was celebrated at an International Aviation Meeting (IAM) of 1910. 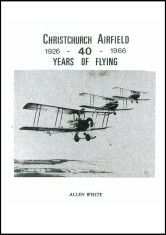 Christchurch History Society has used the drawings, photographs and information within its Archive to put together this compilation to guide the reader to the types of aeroplanes flown at the IAM, together with their duration and capabilities, as recorded in the final results of the competition. 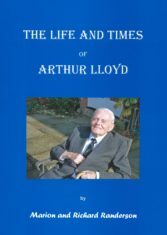 The book chronicles the life and legacy of Arthur Lloyd, the teacher and local historian. The book traces his life, starting with his immediate ancestors; through his childhood and University years; and on to his Army Service in World War II; before discussing his achievements as a schoolmaster and local historian. Arthur became a truly inspirational historian, who brought history alive in the New Forest area and beyond, predominantly covering from The Solent to Poole Harbour. 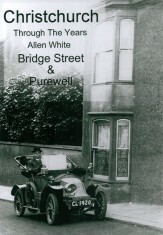 This book pays tribute to his influence on so many people, as well as to the understanding of the history of the area. Written by his daughter and son-in-law. The book is one of a series entitled ‘Christchurch Through the Years’ produced by Allen White (1919 – 1997) an enthusiastic local photographer who had a strong interest in local history. 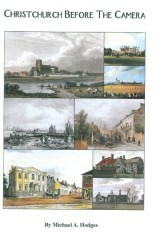 The 1st Edition of “Mudeford and Stanpit Handbook” was one of the earlier books and was followed by “Manor of Somerford” which contained photographs of buildings in Stanpit with explanatory text. This 2nd Edition is a combination of the two books. 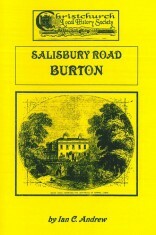 This book is not a history of the whole of Burton but a social history of the more interesting occupants and their associates who lived in the houses along Salisbury Road in Burton. 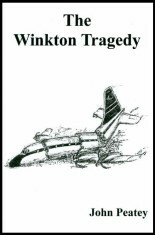 In this book John Peatey investigates the crash of a Britannia airliner which came to earth, in tragic circumstances, at Winkton on Christmas Eve 1958. The book describes the events leading up to the crash, together with eyewitness accounts, photographs and a detailed post mortem of this local disaster. A must for those interested in local aviation.